There has been a growing amount of talk around the U of S, and higher education in general about open textbooks. These are digital textbooks that are freely available to learners and customizable for instructors. Textbooks are expensive, something particularly clear to first year university students. This fact has had a shift toward open textbooks a priority of University of Saskatchewan Student Union President Max FineDay’s since his first term. The provincial government has also this issue on its radar as evidenced by the Saskatchewan government signing a memorandum of understanding to cooperate on the creation of open educational resources with Alberta and British Columbia. There are several commons concerns expressed about the adoption of open textbooks. In terms of adoption there are concerns about quality and a loss to access of resources frequently provided by publishers when traditional textbooks are adopted. 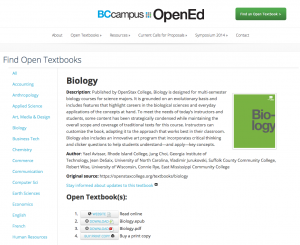 BC has been leading, at least Western Canada in the area of open textbooks through the BCcampus Open Textbook Project. There are currently more than 60 open textbooks listed on the OpenEd Website from twenty-four disciplines including Accounting, Biology, Chemistry, English, Math, and Psychology. Textbooks listed there can be used by anyone free-of-charge (digital versions) and instructors are free to make any modifications they wish to the text, as long as they attribute the source and, in turn, make available the revised work with an open license. Students in BC do have an option to buy printed versions of the books at a fraction of the cost of traditional textbooks. Texts available through the site go through a peer review process (the criteria can be found here) and, for several of the books you can read the reviews of instructors in those disciplines. The Website lists ten books that have received review scores of four or five out of five from these reviewers. Ancillary materials including instructor slides are available for some of the texts as well. BCcampus is actively looking for authors, reviewers and open textbook adopters. If you are interested in adopting, creating, or contributing to an open textbook, or you simply want to know more about this option, please contact us at the GMCTE. The Copyright Act contains a clause that allows for “fair dealing” in formal educational settings. This means that a non-substantial portion of a published work can be re-distributed to students enrolled in a class provided that neither password protection nor digital locks are circumvented. Non-substantial roughly means an article from a journal volume, a chapter of a book, or short excerpt (less than 10% of the overall work). Similarly, “direct linking” or “deep linking” to a particular piece of content within a website (i.e. giving the exact URL of a PDF file containing a paper within a journal) is acceptable provided that neither password protection nor digital locks are circumvented. Please note that some of the library online journal holdings have contracts with publishers that limit how the resource can be used. Some agreements with publishers prohibit the direct distribution of PDF files to students in a class. 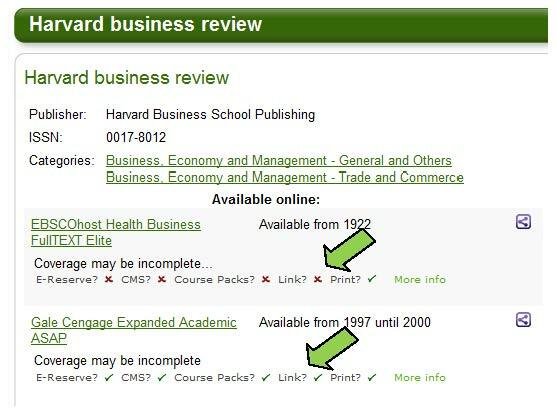 Some agreements limit library reserve holdings, and some agreements prohibit direct or deep links to articles within a journal. So you may be breaking an agreement/contract with a publisher (a civil offence and a violation of the digital locks Copyright Act) while thinking you are acting within the law. Some examples of publishers that do not allow direct linking include American Institute of Physics, American Physical Society, ASME, CSIRO, Harvard Business Review, Hein Online, Optical Society of America. 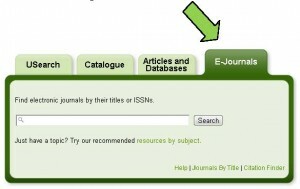 To search for a journal title use the E-Journals tab on http://library.usask.ca. 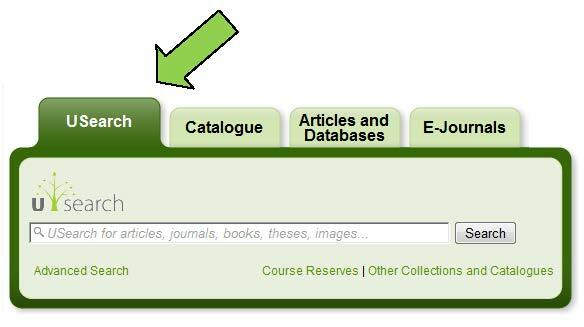 Entering the journal title in the search query box will connect you directly to the usage rights page. The information below the title will denote whether or not you can link to the resource based upon the license agreement. If you use USearch to retrieve your articles, usage information will be presented to you once you click on the article title in your results list. If an article is available in more than one database, you may be able to choose the one that is more lenient with linking. If you are searching directly in a database (e.g. 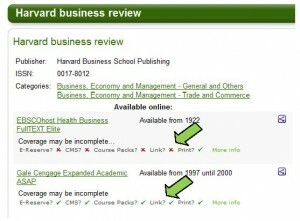 PubMed, MLA International Bibliography), click on the “Find it!” button and the next screen will display the usage rights information for that article.Below is an example of the e-journal Harvard Business Review, showing the usage rights information. Note that one source does not allow direct linking (red “x” to the right of the word “link”), but the other one does. More information about usage rights for an individual title through a particular source/publisher can be seen by clicking on the green highlighted link to “More info”. For information on direct/persistent linking, go to http://libguides.usask.ca/directlinking.